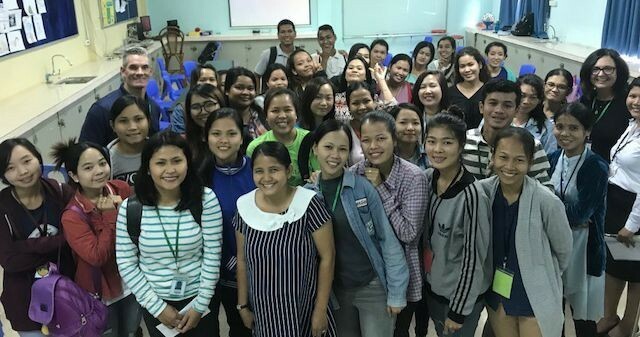 Continuing this fall, Biola’s School of Education professors and recent graduates will provide educational training for Asian Hope teachers, a village development program that seeks to protect children and transform communities in Cambodia. For the past five years, Biola’s faculty have worked directly with the Asian Hope foundation to assist in training qualified teachers in Cambodia. “Our goal is to equip others to serve the Lord Jesus Christ via educational ministry,” said Carolyn Bishop, director of elementary education. From 1975-1979, a government genocide devastated Cambodia, killing 80 percent of teachers in effort to exterminate all education. Today, Biola has helped impact nearly 3,500 students over the last five years, equipping 125 teachers with training to instruct students in the rural Cambodian region. In addition to working with the Asian Hope foundation, Biola also partners with The Teachers Training Program. This comprehensive training program provides instruction in classroom management, lesson planning and innovative teaching methods, to better equip future teachers of Cambodia. All students are welcome to participate. If you are interested in joining the Fall 2018 team, please visit Biola’s School of Education website.